Sabotage is a deliberate act of destruction or work stoppage intended to undermine the activities of a larger entity, whether it is a business, government, or some other organization. The practice of sabotage, which has roots in the labor movements of the late nineteenth and early twentieth centuries, gained military and political application during the world wars and thereafter. It has also been a part of covert operations, often undertaken by agents provocateur. There were isolated examples in earlier times, but probably the first case of organized—albeit apparently spontaneous—sabotage involved the Luddites of late eight eenth century England. Confronted by nascent industriali zation and eager to hold on to their jobs, the Luddites destroyed labor-saving machinery. In 1910, striking French railway workers destroyed wooden railway ties or shoes, known as sabots, and from this act the word was coined. Ironically, a concept associated with labor movements was also used against organized labor by factory owners who hired agents provocateurs, infiltrators whose aim was to incite the local union to acts that would attract the attention of police. 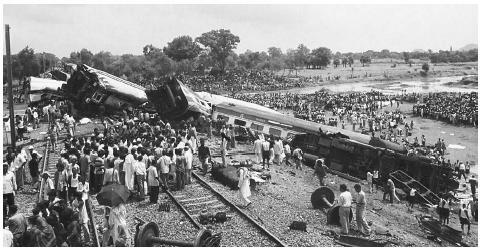 Sabotage is suspected in the September 2002 derailment of an express train on its way from Calcutta to New Delhi in the Indian state of Bihar, leaving one car plunged into a river and two others dangling from a bridge. Fifty people died and 180 were injured. In World War I, the Germans allowed Bolshevik leader V. I. Lenin to enter Russia through their territory, their intention being to sabotage the Russian leadership and pull the country out of the war—a gambit that succeeded. Although the Axis powers attempted to use sabotage against the United States, the most successful act of sabotage in World War II was the British and Norwegian effort to destroy the Germans' supply of heavy water, thus dashing Hitler's plans to build an atomic bomb. During the postwar era, anticolonial movements in what came to be known as the developing world often used sabotage to remove Western influence. These acts ranged from the passive resistance to British rule by Indians under the leadership of Mohandas K. Gandhi, to the destruction of railway lines by revolutionaries fighting against the Portuguese in Angola and Mozambique. Communist-backed groups often used sabotage, although in Communist countries, any hint of real or imagined sabotage directed against the ruling system met with swift and severe punishment. Bailey, Brian J. The Luddite Rebellion. New York: New York University Press, 1998. Gallagher, Thomas Michael. Assault in Norway: Sabotaging the Nazi Nuclear Bomb. New York: Harcourt Brace Jovanovich, 1975. Julitte, Pierre. Block 26: Sabotage at Buchenwald. Garden City, NY: Doubleday, 1971. Sayers, Michael, and Albert Eugene Kahn. Sabotage! The Secret War against America. New York: Harper & Brothers, 1942. Witcover, Jules. Sabotage at Black Tom: Imperial Germany's Secret War in America, 1914–1917. Chapel Hill, NC: Algonquin Books, 1989.